Of the design elements in your new space, one of the most important elements is your vanity. After all you do use it every single day, sometimes even multiple times per day. So you’ve decided to “take the plunge” and get your very own custom bathroom remodel, congratulations! Of the design elements in your new space, one of the most important elements is your vanity. After all, you do use it every single day, sometimes even multiple times per day. Here are some features you can incorporate into your new custom bathroom vanity. Did you know that you can have outlets for all of your favorite styling tools built right into your vanity? Adding outlets can take your custom bathroom vanity to a whole new level of convenience! When you get your custom vanity done, you want it to work for you for a long time. Whether you’re having guests over, or your family is growing, having bathroom storage that changes with you could be a game changer! There are many reasons to choose a floating vanity. They provide a sleek, modern look, and they can make a small bathroom space feel larger. Perhaps best of all, it’s much easier to clean underneath a floating vanity. If you want your bathroom to feel like your very own spa, try some open shelving in your vanity. Place some pretty baskets with toiletries and other personal items. Fold towels and washcloths up nicely and place them in the shelves. Your things will be easy to access, and you will feel like you’re at the spa whenever you walk in! Another way you can create your custom vanity is to go through antique shops and find an old buffet table or a dresser or cabinet. Sand it down and either repaint it or refinish it and add plumbing. We all know the struggle of trying to get ready in the morning and not having enough space for everything we need. 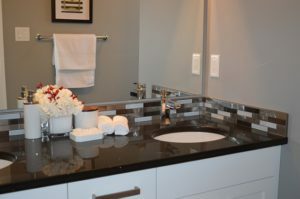 When you’re designing your custom bathroom vanity, make sure it includes ample counter space. About Kitchens and Baths has the Annapolis community abuzz with excitement over our stellar home renovation services. With an approximate timeline of only three weeks and two days for project completion, we outshine the competition in our reliability. From tear out to design, all aspects of each renovation project are handled in house by our expert team. We ensure customer satisfaction and consistent quality for all remodeling services. Visit our showroom to meet the About Kitchens team and discuss your design goals. Our home renovation services are versatile and detail-oriented, supporting all styles, features, and rooms. While kitchens and bathrooms are our primary focus, we also channel our skills to assist home office and laundry room renovations. The sky’s the limit! Call us at 410-573-0877 or email us at aboutkitchensandbaths@yahoo.com or fill out our contact form today! We’re social! Follow our blog, Facebook, Houzz, and LinkedIn for all the latest updates and design ideas! This entry was posted on Friday, April 12th, 2019 at 3:03 pm. Both comments and pings are currently closed.